Last Christmas I was blown away...Mr. Wonderful surprised me with a trip (no, not just a trip...a dream trip) to Italy. He handed me a letter a couple nights before Christmas (because he is terrible with surprises and can't wait). The letter started out, "We have everything we could ever want and then some...except 10 days under the Tuscan Sun". Tears started rolling down my cheeks...I was in disbelief! He knew that was the one place I would LOVE to go. So, this past March we fulfilled my dream. We flew into Rome - spent one night there (so jet lagged - we didn't see much). 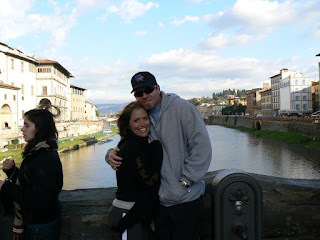 Then, we caught the train to Florence...aahhh Firenze! It was beautiful! We spent 2 nights there (would love more time there). 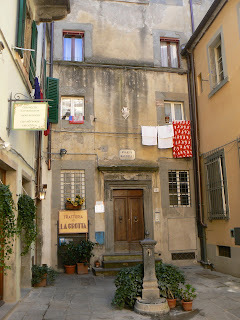 From there we had a driver take us to a villa in Cortona (a village in the Tuscan countryside). Along the way she took us to Pisa and a few other quaint villages. It was all breathtaking! When we arrived at the centuries old villa...I felt like I was dreaming...it was breathtaking! We immediately unpacked in our rooms and nabbed the two bikes I had spotted coming in. 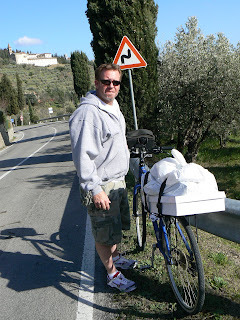 We thought we would take a little cruise into Cortona...a few miles away. "A few miles? No big deal!" I said. Well, it truly was only a few miles...all up hill!!! We rode up a tiny road - full of switchbacks. 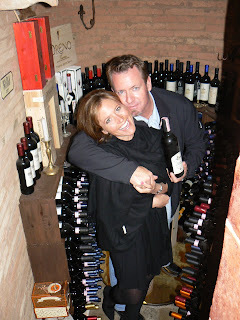 But, we made it...and it made the wine taste that much better and the shopping that much more rewarding! The village is darling. And if Cortona is sounding a little familiar to you - it's because it is the same village where "Under the Tuscan Sun" was filmed. We spent a glorious week in the Tuscan country side. The food was amazing...the wine superb...and the people...delightful! We toured a vineyard, ate and drank, took a cooking class, ate and drank, had massages, ate and drank, visited with the warm and friendly locals...and ate and drank some more! Our trip came to a bitter sweet end (we missed the kids...a little) in Venice. What an incredible city!!! Pictures cannot do it justice. 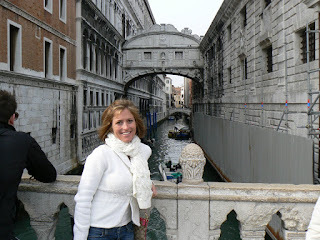 The canals and waterways are spectacular! It's amazing that the residents have adapted to that lifestyle. There are no cars. The stoplights are strung across the canals - for the boats. The cemetery is a separate island. The fire "trucks" and police "cars" are boats. When I asked if they were concerned about children drowning, they looked at me like I was crazy. They laughed and simply said, "no". The food was a little different in this region...not quite as pleasing on the pallet. We were only there for one night and I was bound and determined to eat "local" everywhere we went. So, I had cuttlefish and polenta. Now, the polenta was good. However, cuttlefish is in the squid family. They, like squid, produce black ink. Black pasta and cuttlefish are a specialty in this area of Italy, therefore, I felt I must have it. After a couple of glasses of wine, our entrees arrived. Bob played it safe with spaghetti and meatballs...it looked good...edible. Mine, on the other hand, was a jet black, gooey mess! But, I persevered...and ate a few bites. Now, just imagine how lovely my teeth and mouth looked...black fish ink and red wine! Scrumptious! The next morning, we boarded our taxi-boat and headed to the airport...and said farewell to my newest love. It was the most perfect trip. There was not one single hiccup...it was flawless. Our accommodations, the people, the food...especially the wine were (I'm running out of adjectives) unforgettable. The buildings and history were truly amazing...remarkable. And best of all, I was able to share it with my best friend. We had so much fun together...seeing things for the first time. And he made the w hole thing possible because he knew how much it would mean to me. Thank you my love! so fun. i want to go with my romeo. sans kids!!!! !